Intuitive industries are here. Increased digitization calls on adapted control. Digitization leads to connectivity, which enables two-way energy and information flow. This enables the emergence of an even more efficient world. We strongly believe that automation and active energy efficiency will lead the way in the industrial sector. The now viable large-scale deployment of cost-effective wireless sensors — in addition to the critical work being done in the areas of standards — is rapidly increasing digitization across all industries. Smart connected devices, products, and machines can interact in a transparent way, enabling industries to digitize for more efficiency, more control, and more value. To us, the future of intuitive industries depends on an end-to-end IOT architecture that removes complexity from IIoT adoption. We call this architecture EcoStruxure™ for Industry. Connectivity – standards-driven connectivity has allowed for the large-scale deployment of wireless sensors. In addition, the sensors themselves have become much more cost-effective. The combination of these two factors is rapidly increasing the deployment of IIoT. Mobility – the proliferation of smart devices means communication has become pervasive. User experiences are easy and rich, and technologies such as user recognition are driving even more efficiencies for industries. Cloud – sharing data and working at the same time using the same database to improve efficiency where not possible before. Use of the cloud also means that you can manage your facilities and assets remotely from anywhere, and it enables you to acquire the specialist skills you need to run your business, regardless of the geographic location of those skills. Analytics – the increasing use of analytics in Industry is providing the context and ability for operators to become real-time business decision makers. This resulting optimization can be felt at every level of a company. (1) Our own IoT 2020 Business Report identified operational efficiency as one of the top five business benefits of IIoT. In Industry, we have spoken about operational efficiency for many years, but today is different. IIoT is driving unprecedented levels of operational efficiencies that are activated thanks to the single, unbroken flow of required information reaching the right person at the right time. Quite simply, the result is an overall increase of efficiencies across the business: in productivity, quality, profit, health, and safety. (2) IIoT is transforming the business models of all industries. With IIoT, the rules of competition, production, and service delivery are changing. This disruptive megatrend offers organizations the ability to establish new hybrid product and service offerings that generate fresh revenue streams. (3) In recent years, the importance of safety has grown significantly. Industrial companies must be more safe, more secure, and, at the same time, more productive. Every level of machines, plants, and businesses can benefit from the focus on safety and cyber security, with a positive effect on the bottom line. In addition, our industrial automation services help customers navigate these areas with extensive expertise and service plans specific to their business. Industry always has been at the forefront of connectivity, productivity, and efficiency, continuously striving for operational improvements. 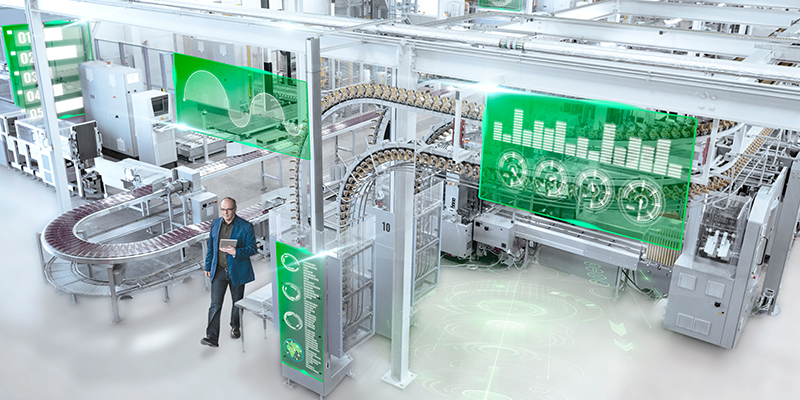 Industry is the first sector where Schneider Electric connected everything. For us, then, the Industrial IoT is not a revolution. It is an evolution because we have been driving connectivity in this sector since 1997 when we introduced the idea of a Transparent Factory boldly based on Internet technologies and Ethernet instead of proprietary networking protocols. Twenty years later, digitization, connectivity, embedded systems, and software are second nature to us. And our business always has been about best-available devices: machines, transformers, circuit breakers, drives, and PLCs. These are the “things” that make the Industrial Internet of Things even more exciting to us. The evolution of IIoT is now starting to see the full end-to-end integration and complete solutions for automation and control systems. We have never stopped innovating to achieve this — building the smart machines, plants, and operations to make industries more intuitive. Bringing together connected products, edge control, and apps, analytics & services enables an end-to-end offer — something no other company can bring to its customers today. This complete capability is made possible by Schneider Electric’s Innovation at Every Level. And it’s rapidly changing today’s and tomorrow’s industries. IIoT may very well expand to “Intuitive Industries of Today”! The Cloud technology is unleashing the dynamics of Connectivity to hugely spawn the business of Cyber Security of Enterprises. These three C’s are going to rule the world of intuitive industries in the times to come. Since the the turn of the 21st Century, Schneider Electric has been the pioneer in driving connectivity in the industry sector. With such a past, Schneider is at present the top future-ready company!